Hot Air Blower Hose is a high-heat grade EPDM rubber hose designed to connect the compressor to the storage tank on a dry-bulk trailer. 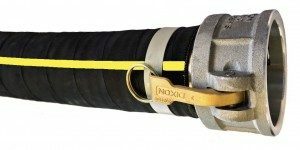 This hose is designed for the rugged outdoor use required in tank transport, in-plant transfer, and offloading site applications. Hot air blower hose is available in black or brown ozone resistant cover, with a textile and helical wire reinforcement. The helical wire provides for full vacuum even at elevated temperatures, kink resistance, as well as a means to ground the assembly. This hose is available in a variety of standard sizes and can also be custom built in up to 14 inch diameter including fractional pipe sizes.